It's going to take some great accomplishments inside the ring for lightweight Sharif Bogere to be known for more than his unbelievable ring walk. The native of Uganda, who now lives in Las Vegas, is carried to the ring in a cage while wearing a lion skin and lion head. It is something that has to be seen to be believed. Bogere is 23-0 with 15 knockouts and has finished four of his last five fights in three rounds or less. But even as he prepares to challenge Richard Abril for the vacant WBA lightweight title on Saturday in the main event of a Showtime-televised card at the Hard Rock in Las Vegas, it's his ring garb and entrance that gather the most attention. In an interview with Showtime, Bogere said that the lion head and skin he wears came from a lion that was killed in Africa after it had mauled several people. In 2008, my manager saw my fighting skill. 'Oh, you fight like a lion! If you get a lion, I think the people of the world would love it.' The ring walk is tremendous. People go crazy. Bogere said he was looking to do something memorable that would excite the fans. He said he used the wild ring entrances of the late Hector Camacho and Prince Naseem Hamed as inspiration. His walk is up there with any in boxing history. And Bogere, 24, said it has worked for him. This lion is part of me. I go into the ring and take care of business. When I come out, I'm victorious. 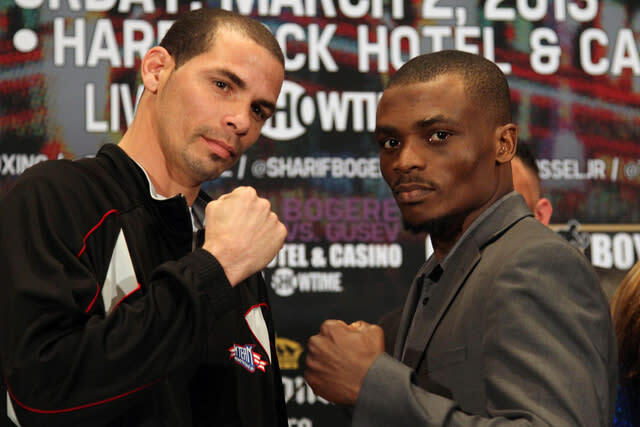 He faces a tough challenge from Abril, a slick Cuban who is a good boxer and is currently about a 9-5 favorite. Abril, who lost a hotly disputed decision to Brandon Rios last year, said at Thursday's news conference he isn't intimidated by Bogere. "He’s a lion, but I'm a tiger, and the real king of the jungle is the tiger," Abril said. That will be proven in the ring on Saturday at the Hard Rock. There is no doubt, though, that Abril can't touch Bogere when it comes to a flashy entrance. Speaking of flashy, the uber-talented Gary Russell Jr., the Yahoo! Sports Prospect of the Year in 2012, will open the show against Vyacheslav Gusev.